Surrounded by a close-knit group of seasoned agents, owner/broker Ghy Manning has created a special boutique brokerage firm. A real estate veteran in the Bedford area for over 26 years, Ghy has listed and sold hundreds of millions of dollars of luxury estates, vacant land, weekend retreats and homes of every size. Ghy is consistently the recipient of the Diamond Award of Excellence (the county's most prestigious real estate honor), and the top 1% of county wide for real estate sales. An avid equestrian throughout her life, Ghy has sold horse properties and equine facilities throughout New York, Connecticut and Florida. Ghy is known as a leading horse property specialist. Growing up in Bedford Ghy has intimate knowledge of Bedford and the surrounding areas. 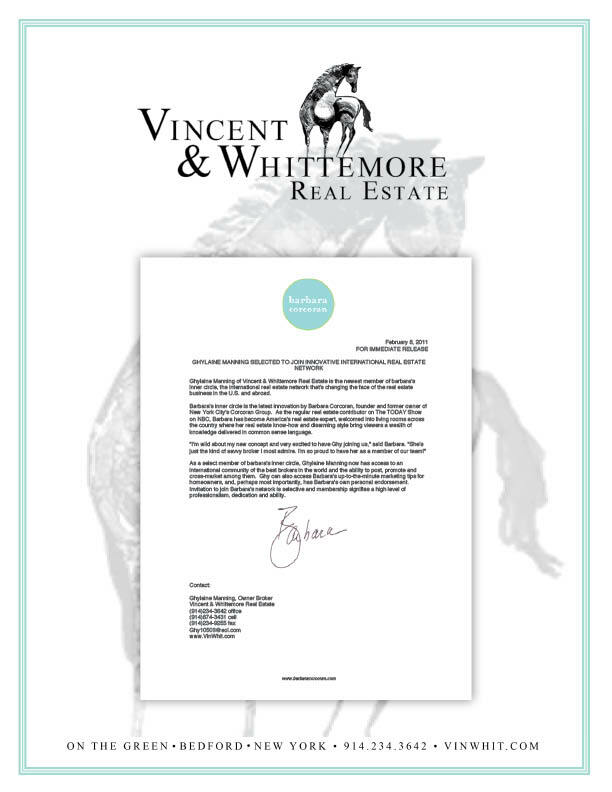 Ghy Manning's primary goal for Vincent & Whittemore is to continue to provide personalized service and integrity.